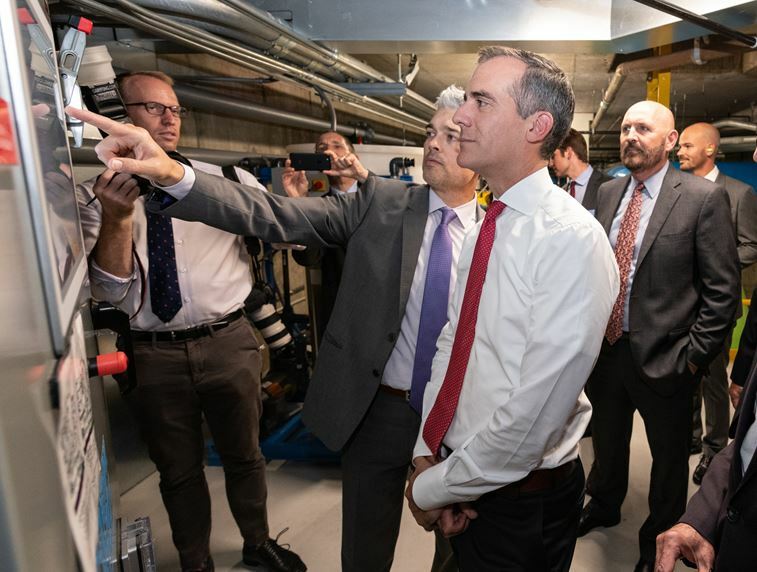 LA Mayor Eric Garcetti (C) and LADWP General Manager David H. Wright (R) tour Cedars-Sinai’s groundwater reuse system. LOS ANGELES (August 23, 2018) – Los Angeles Mayor Eric Garcetti was joined by Los Angeles Department of Water and Power General Manager David H. Wright, Board of Water and Power Commissioner Christina Noonan and representatives from the Metropolitan Water District of Southern California (Metropolitan), to recognize Cedars-Sinai Medical Center’s efforts to reuse groundwater as part of its operations, saving up to 29 million gallons of drinking water annually. Officials congratulated the L.A. medical center’s leaders for their commitment to sustainability and water conservation, and encouraged other L.A. businesses to implement similar groundwater recycling projects. Groundwater runs under portions of the city, including the area in West LA where the Cedars Sinai Medical Center campus sits. In areas where groundwater is present, it must be diverted in order to maintain the structural safety of the buildings above it. Cedars-Sinai installed a recycling system to reuse the groundwater instead of discharging it to the sewer. The system now provides 50-80 percent of the water used by Cedars-Sinai’s cooling towers, offsetting the need for using drinking water for this function. LADWP provided a $155,355 incentive to Cedars-Sinai Medical Center through the Technical Assistance Program (TAP), which offers rebates for the installation of water saving projects and equipment to commercial, industrial, and institutional customers as well as multi-family residential customers in Los Angeles. This joint effort between LADWP and the customer helps modernize the customer’s facility with the latest water-efficient equipment, save on water costs, and conserve water. Since LADWP’s TAP launched in1991, LADWP has rebated customers a total of $9.5 million for 800 water-conserving projects unique to each customer’s operational needs. To date, TAP is credited with saving1.5 billion gallons (4,500 acre feet) of water, equivalent to enough water to supply 13,500 single family homes on an annual basis. Cedars-Sinai will also receive about $168,000 from Metropolitan’s Water Savings Incentive Program, which provides a cash incentive to businesses and industrial facilities for the installation of water-saving technologies and devices. To qualify for an LADWP TAP rebate of up to $250,000, customer must install pre-approved equipment and products which demonstrate water savings. Some examples of past TAP projects include cooling tower water efficiency upgrades, equipment upgrades that replace less water-efficient equipment, and installation of microfiltration systems that enables the reuse of wastewater. More information on the program can be found at www.ladwp.com/TAP. For more information on LADWP’s other water conservation programs and rebates, visit www.ladwp.com/waterconservation.